Welcome to the July Point of View reveal! First, I would like to introduce you to our new Point of View member Leanne from Organize and Decorate Everything. I think she's going to make a great addition to the group. Also, our guests this month are Michele from Michele Made Me and Carolina from Always Expect Moore. Thanks for joining us, ladies! Such a wide variety of projects this month. Love it! You can check out each of the projects by visiting the individual blogs listed above, and scroll down here to see the tutorial for my Summer Treasures Belt. I love these cute little belts! I made one for each of my girls. 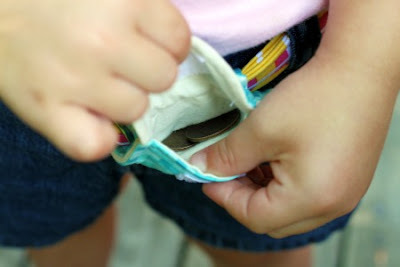 It's a belt with a tiny pouch for holding little shells, rocks, money for the ice cream truck, a ticket for the carousel... all the essential little treasures that are important to kids in the summertime. Step 1: Start by making the belt. There are several D-ring belt tutorials out there, and there are even instructions on the back of the D-ring package. This is how I made mine: Measure around the child's waste and add 7". We'll call this Measurement A. 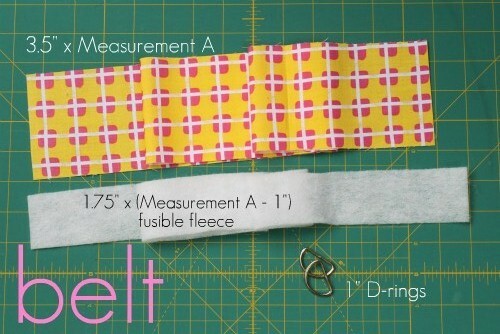 Cut your belt fabric 3.5" wide by Measurement A long. Cut a piece of fusible fleece 1.75" wide by (Measurement A minus 1") long. 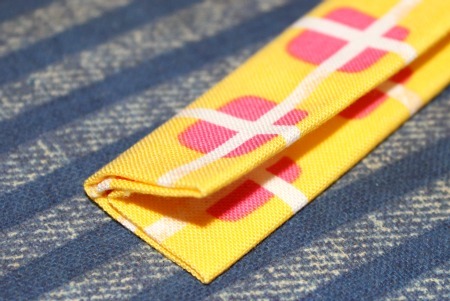 Step 2: To make the belt, you're going to create a giant piece of bias tape. Take your fabric and press in half lengthwise, wrong sides together. Open it back up and press one long edge into the center crease. Press the other long edge into the center crease. Step 3: Open the fabric up and center your fusible fleece inside the fabric. There should be about 1/2" of space on either end. Fuse the fleece to the fabric following the manufacturer's instructions. Take both short ends of your fabric strip and press them in about 1/2". Press the long edges of your fabric back into the center. Fold the entire piece in half lengthwise again and press really well. Your fabric strip should be about 7/8" wide now. Step 4: Pin the entire length of your fabric strip together. Topstitch around all 4 sides (both short ends and both long sides) about 1/8" from the edge. Step 5: Take one end of your fabric strip and slip it through both D-rings. Fold the end over about 1" to hold the D-rings. Stitch the fold closed about 1/8" from the end of the strip. Go over it two or three times to reinforce it. Now you have a belt! Step 6: Now to make the tiny treasures pouch. 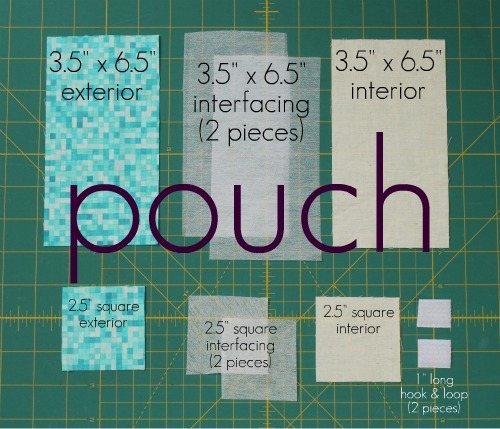 You need to cut one piece of exterior fabric, one piece of interior fabric, and two interfacing pieces in each of these sizes... 3.5" x 6.5" and 2.5" x 2.5". Iron the interfacing to the wrong side of each piece of exterior and interior fabric. Step 7: Take your 3.5" x 6.5" piece of exterior fabric and measure down about 1.5" from one of the short sides. Mark this point. 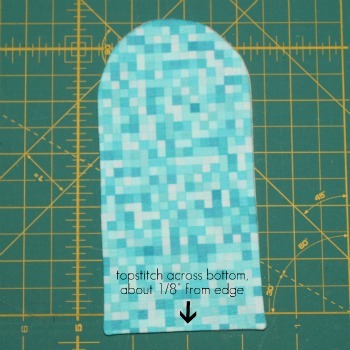 Find a round object (like a cup or a small bowl) that you can trace around to get the rounded edge from the mark you just made up to the short edge of the fabric (see photo below for clarification). Mark this rounded edge and cut out. Repeat for the 3.5" x 6.5" piece of interior fabric. Step 8: Take your 3.5" x 6.5" piece of interior fabric and lay it down right side up. Measure down about 1/2" from the top of the curve. Place the top of one half of your hook and loop tape at this point. Center the hook and loop tape horizontally and sew to the right side of your interior fabric. 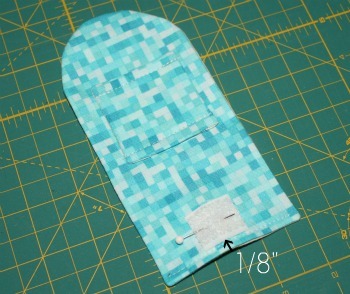 Step 9: Place your 3.5" x 6.5" pieces of exterior and interior fabric right sides together. 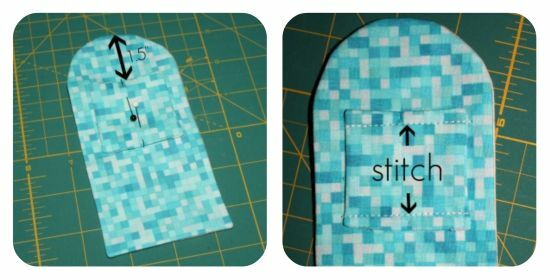 Sew around the outside edge using a 1/4" seam allowance. Leave a 2" opening along the bottom for turning. Clip the corners and the curve along the top. Turn right side out and press, making sure to press in the raw edges of the opening along the bottom. Topstitch along the bottom about 1/8" from the edge to close your opening. Set this piece aside. This piece will eventually become your pouch. Step 10: Take your 2.5" square pieces of exterior and interior fabric and place right sides together. Sew around the outside edge using a 1/4" seam allowance, leaving a 1.5" opening on one side for turning. Clip corners and turn right side out. Press, making sure to press in the raw edges of the opening. Step 11: Grab your pouch piece and lay it out with the exterior fabric facing up. Measure down 1.5" from the top of the curve. This is where the top of your square piece from Step 10 will go. Center the square horizontally, with the exterior fabric facing up. Make sure that the opening you left for turning in the square is either at the top or the bottom. Pin the square to your pouch piece. 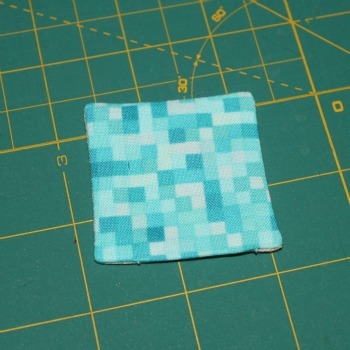 Sew the square to your pouch piece along the top and bottom edges of the square about 1/8" from the edges. DO NOT sew along the left and right sides of the square. 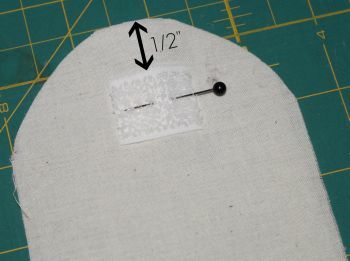 Step 12: With the exterior fabric still facing up, measure 1/8" up from the bottom of your pouch piece. This is where the bottom of the other piece of hook and loop tape will line up. Center the hook and loop tape horizontally and sew to the pouch piece. Step 13: Flip your pouch piece over so that the interior fabric is facing up. Take the bottom edge and fold it up about 2.25". Press. Pin in place. Topstitch along the left side, around the curve of the flap, and along the right side about 1/8" from the edge. I added a little button embellishment to the flap of my pouches, which you can do at this point if you'd like. Now just slip your belt through the loop on the back of the pouch, and you're done! 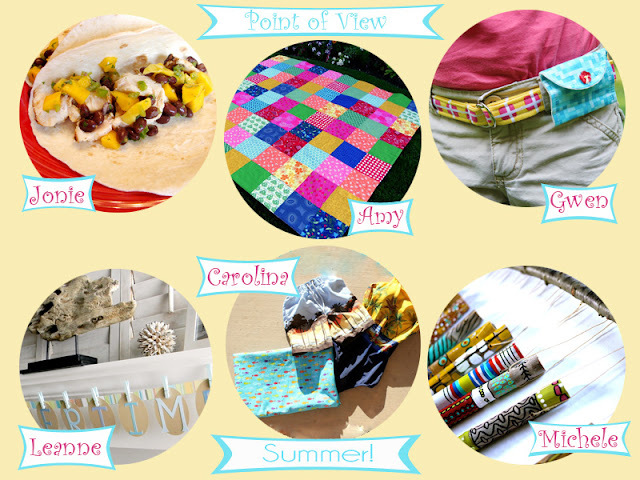 OK, now you can run over to the Point of View Summer Link Party at Organize and Decorate Everything :) I'll be featuring some of your summer projects in a post next week. Hope to see you at the party! 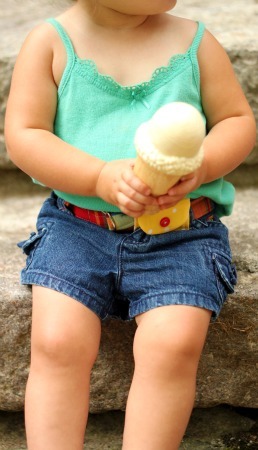 What an adorable belt for storing treasures or coins from the fairy tooth! Looking forward to checking out the projects for this month. Have a great weekend Gwen! Such a cute idea, and just last week we could have used it! The ice cream truck went by when we were doing a lap around the block on Luke's bike, and we had no money on us. Will have to stash this one away! These are so great Gwen. My son is forever stuffing his pockets with rocks and sticks and "treasures" he finds. Also he's darned skinny. You think a summer treasures belt might suit him? That's a big 10-4, I'd say. Great tutorial too, lots a detail (which I need). I love how you lay everything out so nicely and clearly in your tutorials in general. Fabulous! Thanks for having me over for the POV by the way. This has been really fun! My daughter would love one of these! She is always packing around little "treasures" and trying to find bags to stick them in. I will have to give it a try. I LOVE this Gwen! It is adorable and a wonderful idea. I'm sure any kid would love having one more place to stuff their treasures! Oh cute! The sad thing is I want one for myself! Gwen, these are adorable! Perfect for summer outings. SUCH a good idea Gwen! Just love the colors too. This is such a cute idea and they turned out so adorable. My kids would have loved this when they were younger. Thanks for letting me join the group. I'm so excited to be part of you talented group of ladies. This could help my washer and dryer which keep getting LOADS of rocks in the little ones pockets!! So practical, pretty and fun! Perfect for little dudes, too. Great project, Gwen! This is so lovely! What a better place to hide your found treasures?! Such a sweet project, Gwen. I love the photo with the ice cream cone. I hope the belts get lots of use. I think this is a great sewing idea. I am even going to try to make one for myself. I linked you into my spanish blog, I hope you don't mind.